« Louisville Crowds on Derby Day? Problem, Solved–Here on Union Ave., in Saratoga. These days, almost everyone is health-conscious, for one reason or another. People with Celiac Disease can’t eat gluten. People who take blood thinners have to avoid most green, leafy things, including cilantro and even parsley. And of course, so many people are allergic to tree nuts that it’s almost epidemic in the 21st Century. Yet-others just want to keep it low on the cholesterol/protein/sodium scale, just as a preventative measure. 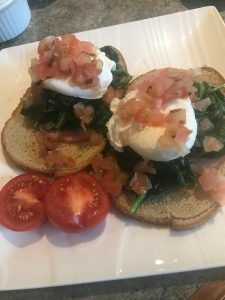 This delicious and filling breakfast is a healthy, lively combo of rye toast, Canadian bacon, sauteed spinach and poached eggs–all topped with fresh, hand-made pico de gallo. Perhaps we’ll name this yummy offering, Pico de Benedict.